How Will Dirt & Clay Dissolve in a Clogged Drain Pipe? 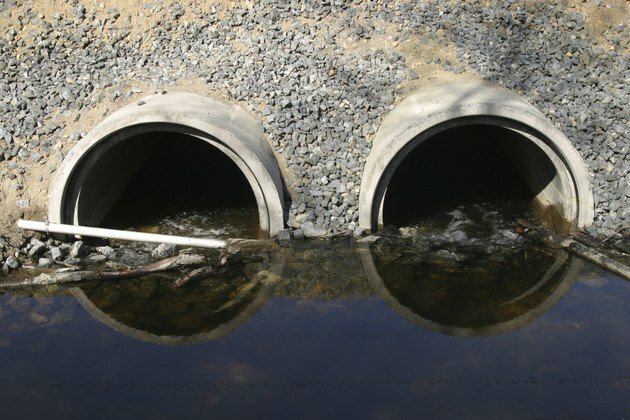 Most older sewer lines are made from clay, and even most newly built structures with PVC drain lines eventually discharge into a city waste system comprised of clay pipes. Any product that would dissolve dirt and clay lodged in a drain pipe would also attack the system itself at some juncture. Dirt and clay blockages must be dealt with by destroying the "net" that stopped them from simply being washed away in the first place. Clogged drains quickly back up into buildings. Solid matter should not be flushed into drainage systems, and -- for the purposes of discussing blocked sewer lines -- soil and clay are solids. Soil could enter through disintegrated mortar joints underground or after washing items, such as flower pots or gardening clothes and equipment, indoors. Clay is most often associated with cat litter, which is primarily made of clay. Even the lumps of used clumping cat litter do not break down and get flushed away as grains when they hit water. They stay as clumps of clogging material. Trees are expert at locating and accessing water. They force their roots through any small crack in drains that they can create or exploit and then clog the line as they grow. They become a "net" in which other material, including the waste that should be flushed away, becomes trapped. Eventually, toilets and sinks can back up because of such impediments. In extreme situations, tree roots in drains can grow so large they fracture the pipes. The most common emergency drain openers are based on sulfuric acid. Their content is typically in excess of 90 percent sulfuric acid, with a small percentage of corrosion inhibitors intended to prevent damage to metal drainways. So as to restrict their use to trained professionals, sulfuric acid drain openers are not available for retail sale. Sulfuric acid effectively disintegrates all organic matter, including fats, food residue, grease, hair, paper, rag, sanitary napkins, soap scum and tree roots. Their disintegration allows flushed water to then clear the pipe of soil and clay that was also caught. Drain openers based on sulfuric acid cannot be used on systems that include aluminum, chrome, galvanized steel and stainless steel components. Drain openers based on hydrochloric acid can be used in systems with plastic components and any metal component other than aluminum or galvanized steel. The solution typically contains approximately 30 percent hydrochloric acid in a solution designed to suppress foaming and inhibit corrosion. Hydrochloric acid disintegrates mineral deposits and solid salts, such as those that accumulate from hard water and urine as well as rust and scale. Hydrochloric acid will also dissolve concrete, grout and plaster deposits that have accumulated in drains. Non-acid-based products are available for use in systems with components that react badly to acid. While still effective, these products are not as potent as their acid-based cousins, and are more frequently used along with mechanical snaking. Products are manufactured specifically to destroy roots in drain systems. A blend of active root-killing herbicides and foaming surfactants kill and disintegrate existing roots while discouraging regrowth by clinging to the interior surfaces of the drain. Variants are produced both with and without copper sulfate, the latter intended for use in areas where the release of copper into sewer lines and cesspools is forbidden. These areas include the state of Connecticut and the San Francisco Bay.